Time travel is one of the classic storytelling devices in superhero comics, and for the current Peter Parker: The Spectacular Spider-Man arc, “Amazing Fantasy,” writer Chip Zdarsky has Peter meeting his past self to stop an alien invasion facilitated by The Tinkerer, a C-list supervillain tired of not being taken seriously. 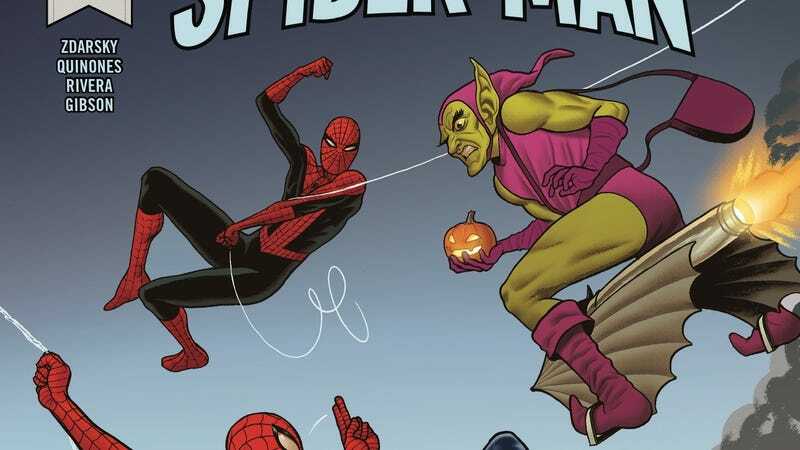 Zdarsky is joined by his old Howard The Duck art team of penciler Joe Quinones, inker Joe Rivera, and colorist Jordan Gibson for this journey to Spidey’s early days, and this creative team’s established rapport has significantly elevated the series. Quinones is a better fit for Zdarsky’s writing than previous artists Adam Kubert and Juan Frigeri, who did strong work with the superhero action but struggled when it came to the humor that is such a huge part of Zdarsky’s voice. Quinones has more expressive characterizations and sharper comic timing, giving the series extra charm while deepening the emotional content. This exclusive preview of next week’s Peter Parker: The Spectacular Spider-Man #302 spotlights the specificity of Quinones’ pencils and how well he works with Rivera and Gibson to give this book a retro feel. Rivera is one of the best inkers in the business—he won an Eisner Award for his very first inking gig on Daredevil—and he brings crisp definition to Quinones’ lines. The richness of the inks adds vitality to the characters, and Gibson’s coloring reinforces emotional shifts and makes specific moments pop. The second page of this example is a great example of this: The first three panels have a mint-green background that shifts to blue when Flash starts his comment about Peter’s dead uncles, and then red when teenage Peter is overwhelmed by rage. Those colors intensify the story beats, and the strength of this art team brings greater depth to Zdarsky’s scripts.